Born on April 20, 1941 and raised on a farm 60 miles west of his current home in Mankato, Glen Taylor graduated from Comfrey High School in 1959. He received his Bachelor of Science degree in Math, Physics and Social Science from Mankato State University in 1962. During this period, he worked part time at Carlson Wedding Service. Later he would own the company. He continued his education at the Harvard Graduate School of Business. Glen has five children: Terri, Jean, Taylor Moor, Jeff and Kendahl. Appointed by Governor Arne Carlson in 1991 to the Commission On Reform and Efficiency (CORE) where he served as Committee Chair. In 1996, South Central College presented him with a honorary degree, an Associate of Applied Science Degree in Graphic Arts. Mankato State University awarded Taylor its first honorary doctorate on June 7, 1996. Taylor received the degree of Honorary Doctor of Laws for his distinguished professional career and volunteer service. 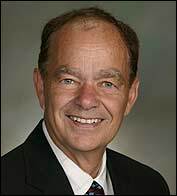 Glen was elected to the Minnesota Senate in 1980 and served until 1990. He became Assistant Minority Leader in 1982. From 1984 to 1986, his fellow Senators elected him Minority Leader of the Senate. He provided leadership in the areas of higher education, child care and economic development policies. Glen is the Chairman of the Board of Taylor Corporation. The Taylor companies include more than 70 operating divisions in 19 states, three Canadian provinces, the United Kingdom, Australia, the Netherlands, Sweden and Mexico. They employ more than 5,000 Minnesotans. Total Taylor employment exceeds 14,000 employees. On August 5, 1994, Glen Taylor reached an agreement to buy the Timberwolves. His purchase ended months of speculation about the long-term future of the team and guaranteed that the franchise would remain a part of the Minnesota sports scene for many years to come. In 1999 he added the WNBA women's basketball team, the Minnesota Lynx, to the growing list of Minnesota sports teams.